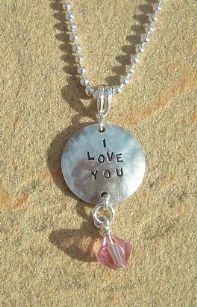 This necklace is not engraved, it is hand stamped, one impression at a time. We then hammer the piece to give it a somewhat distressed, aged, but contemporary look. The alignment of each impression will not be exact. This will add to the overall hand crafted interest of each piece. Once the word, name, number or design is stamped, our charms are blackened, sometimes oxidized to better define the impression. 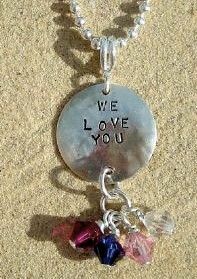 The finished charm is polished, then attached to a sterling silver beaded chain. sterling bail shown, no longer available. IDEAS: "We Love You" "I Love You"
Your keepsake will arrive in a organza pouch for safe keeping and/or immediate gift giving.